Good Evening Everyone, how are you all spending your last hours of winter? While we transition to a new season, “Wellness Wednesdays” will take a short hiatus. I will kick off the spring series when I begin my Ayurvedic Spring Detox this weekend. 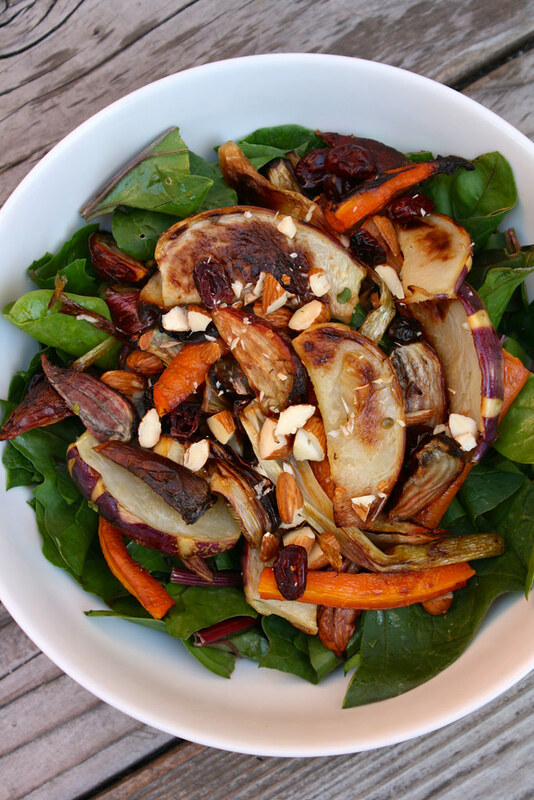 This evening, I have a wonderful “farewell winter” salad, a mix of heart roasted winter vegetables atop a bed of spring spinach, topped with a fragrant pomegranate vinaigrette. As the “Vernal Equinox” nears, springtime is on the horizon, at 9:57 am (PST) tomorrow to be exact! While I enjoy the cool & quiet “winter” months (what little bit of winter we experience here in So. Cal), I am really looking forward to spring. Spring is a time of renewal & blossoming, a perfect time to “renew your good intentions for the year & blossom into your true self.” It’s also a time to clean out the fridge to make space for lighter, crisper spring produce! I did just that the other day, as I make way for all of the zucchini, peas, & spring greens that are on my CSA list for the week. Gathered in the crisper was a bunch of winter carrots, kohlrabi & beets, & spring onions & spinach. 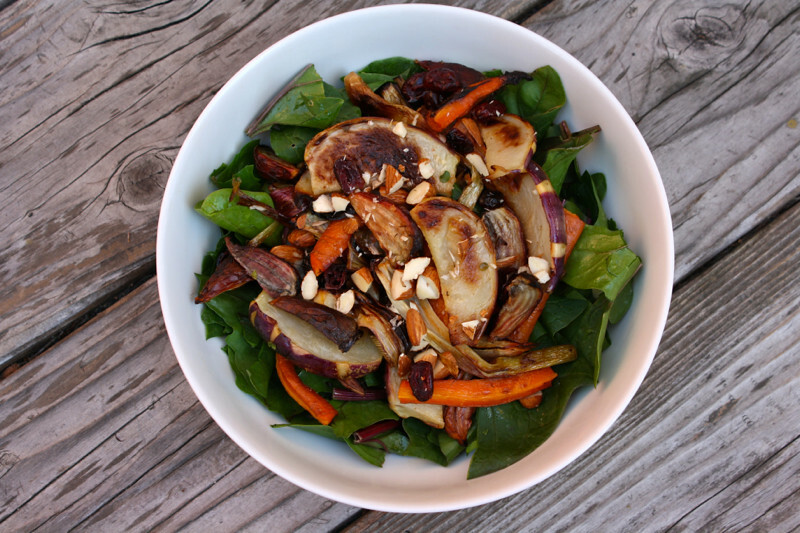 As I prepare to start incorporating more green juices & raw foods back into my regular diet, I decided to make my last batch of winter roasted veggies, but served atop raw greens, instead of a grain to keep it light. The star of the show? Kohlrabi! 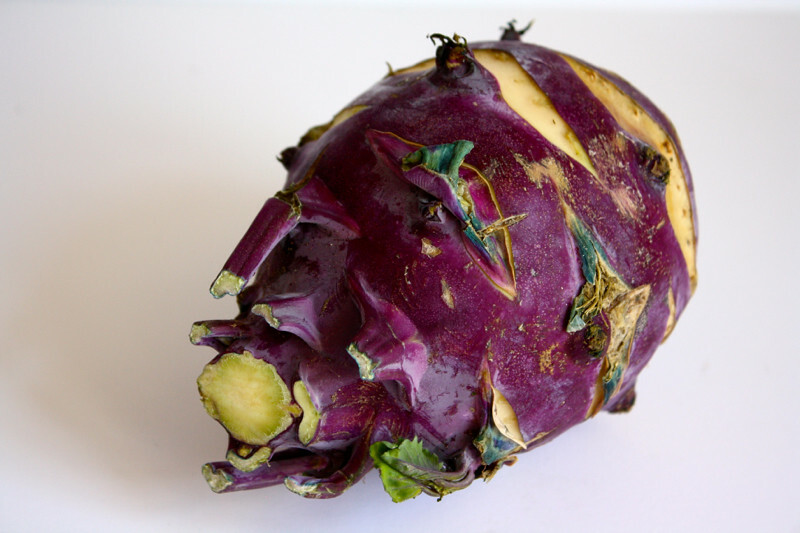 Kohlrabi is one of the most unique & perplexing vegetables that I have encountered thus far. This vibrant vegetable is very low calorie, high in vitamin C & fiber, & is a good source of vitamin B6 and potassium, too. It’s also fairly high in minerals, including copper & manganese. It can take a bit of preparation to peel & chop, but raw kohlrabi is crisp, mild & refreshing. One of my favorite ways to eat it is just peeled & cut into thick matchsticks, sprinkled with a bit of sea salt, & dipped into hummus! (BTW this mung bean hummus is divine!). But with two extra large heads in the fridge, I was looking for new ways of enjoying it. I found this article on Huff Po, which recommended this recipe & was hit with inspiration abound! It turns out there are so many things you can do with kohlrabi – who knew? You can shred it, mash it, stuff it, puree it, batter & fry it, roast it, you name it. 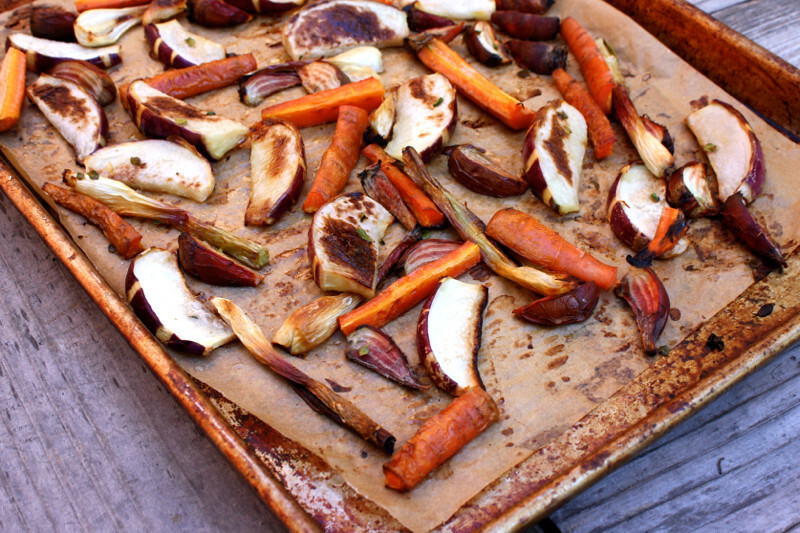 As I love the sweet & caramelized flavor of roasted vegetables, but typically reserve roasting for winter, I decided for one last roasting hurrah. 2. Cut vegetables in desired shapes & sizes, then toss with avocado oil, sea salt & pepper. Roast for 35 minutes. In a small mason jar, shake together the oil, vinegar, mustard, teaspoon salt, & pepper. 2. 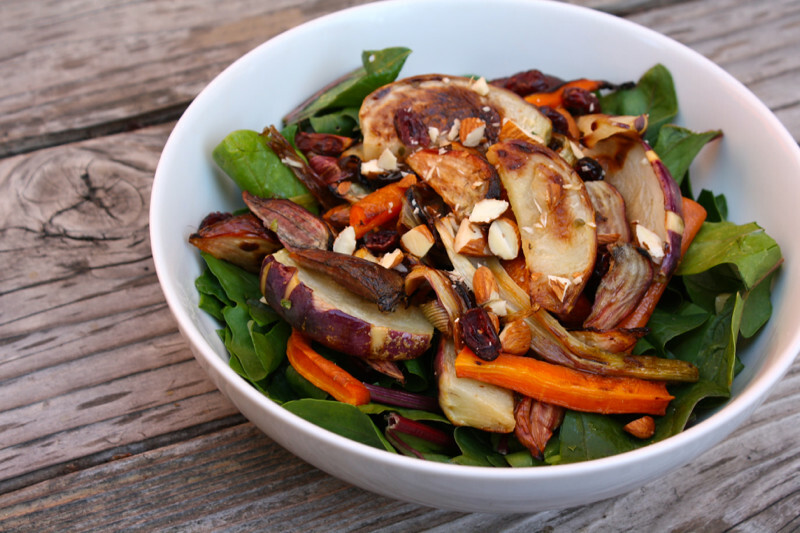 Place roasted vegetables atop the greens & garnish with chopped almonds, dried pomegranate seeds, & an extra drizzle of dressing. ***After photographing this salad, I realized what a beautiful addition some raw vegan “Sun Cheese” that I learned at my dear friend Katie’s cooking class. So I made a batch (it’s simple soaked sunflower seeds, garlic flavored olive oil, sea salt & lemon juice), & my oh my! Extra decadent & delicious! Such a beautiful salad to serve on a platter to a hungry crowd, or served in a bowl for a hungry girl! 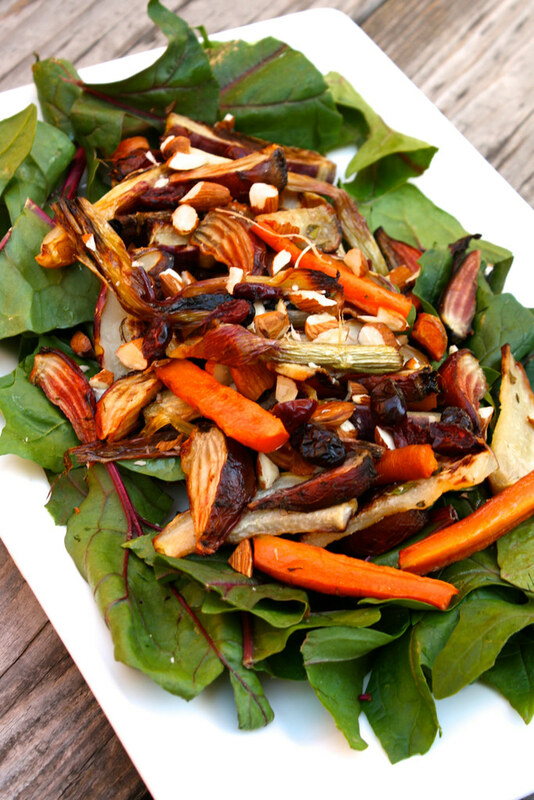 I loved all the flavors & textures in this salad, the sweet & caramelized veggies, crisp greens, crunchy almonds, & tart & tangy dressing all married together beautifully. Such a wonderful way to honor the season’s transition. How do you like to celebrate the arrival of spring? As I mentioned, it is a time of renewal & blossoming, & a perfect time to “renew your good intentions for the year & blossom into your true self.” The month of March has brought many changes into my life, some unexpected, some planned. I changed my last name (took my Grandma’s maiden name), found a wonderful but more budget friendly apartment & am moving again next week, & it is looking like there are going to be some big changes in my career. As doors close, new ones tend to open, & I am ready. I am gearing up to begin a major spring cleanse, & starting my Deep Yoga Teacher Training program at the end of April. Certainly a time of transition, growth & intention.